Link to a general introduction to hypnosis, adapted from Kihlstrom, J.F. (1998). Hypnosis and the psychological unconscious. In H.J. Friedman (Ed. ), Encyclopedia of mental health (Vol. 2, pp. 467-477). San Diego: Academic Press. Link to another general introduction, by Michael Nash, reprinted from Scientific American (July 2001). Link to a fuller discussion of the same issues, reprinted from Kihlstrom, J.F. (2008). The domain of hypnosis, revisited. In M. Nash & A. Barnier (Eds. ), Oxford handbook of hypnosis (pp. 21-52). Oxford: Oxford University Press. Link to a discussion of consciousness in hypnosis, reprinted from Kihlstrom, J.F. (2007). Consciousness in hypnosis. In P.D. Zelazo, M. Moscovitch, & E. Thompson (Eds. ), Cambridge handbook of consciousness (pp. 445-479). Cambridge: Cambridge University Press. Link to a discussion of hypnosis and pain control: Kihlstrom, J.F. (2000, November). Hypnosis and pain: Time for a new look. Plenary address presented at the annual meeting of the American Pain Society, Atlanta. Link to a further discussion of hypnosis and pain control: Kihlstrom, J.F. (2001, August). 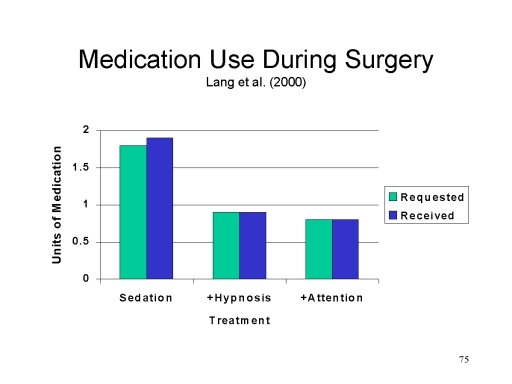 Hypnosis in surgery: Efficacy, specificity, and utility. Paper presented at the annual meeting of the American Psychological Association, San Francisco. posthypnotic amnesia, in which the subject cannot remember the events and experiences that occurred. All of these phenomena involve alterations in the monitoring or controlling functions of consciousness (or both). But none of them, including posthypnotic amnesia, occur except in response to suggestions made by the hypnotist. Except under specific circumstances, these suggestions are canceled before the subject leaves the hypnotic setting. As with the dissociative phenomena of "hysteria", hypnotized subjects do not show any alterations in nervous system structure sufficient to account for the subject's experiences. Since the end of the 19th century hypnosis has been considered to be a laboratory model for the "hysterical" (i.e., dissociative and conversion) disorders sometimes seen in the clinic. That is, many of the cognitive and emotional changes produced by hypnotic suggestion are similar to those seen in the dissociative and conversion disorders. For example, psychogenic amnesia, fugue, and the interpersonality amnesia of multiple personality disorder have parallels to posthypnotic amnesia. Hypnotically induced blindness, deafness, and paralysis are phenotypically similar to "hysterical" blindness, deafness, and paralysis. The more recent history of hypnosis begins with Franz Anton Mesmer, an 18th-century Austrian physician who believed that disease in various organs was caused by an imbalance of animal magnetism -- an imbalance which could be corrected by a crisis elicited when the "magnetizer" passed his hands over the patient. Mesmer's theories were discredited by a French royal commission, but his practices persisted. When the Marquis de Puysegur experimented with animal magnetism, Victor Race, a peasant on his estate, fell into a sleep-like state instead of a magnetic crisis. During this state, Victor was highly responsive to instructions, and awoke with an amnesia for what had occurred during the sleep. This incident is the beginnings of hypnosis as we know it today. In the mid 19th century, mesmerism was picked up by the British physicians Elliotson and Esdaile. Braid coined the term hypnotism, and speculated that the state was due to the subject's concentration on a single thought. In the late 19th century, hypnosis was studied in France by Charcot, Janet, Bernheim, and Freud. Charcot thought that hypnosis was a form of hysteria, and Freud's observation of hysterics' response to hypnotic suggestions was the origin of his psychogenic theory of mental illness. The French revival of hypnosis was carried to America by William James and Morton Prince. P.C. Young and C.L. Hull began a tradition of experimental work which declined during the heyday of behaviorism, and was revived in the 1950s by T.R. Sarbin, E.R. Hilgard, J. P. Sutcliffe, M.T. Orne, and T.X. Barber. Their students (Orne was my mentor in graduate school), and their students' students in turn, created an upsurge of experimental work beginning in the 1960s and 1970s that continues to this day. In one way or another, research on hypnosis has been framed by a debate between what Sutcliffe (1960, 1961) called the "credulous" and the "skeptical" views of hypnotic phenomena. According to the credulous view, "Mental processes affected by hypnosis are the same as those that would be instigated by the actual stimulus state of affairs". In the case of hypnotic blindness, for example, the subject would behave as if there were no visual stimulus present, or the optic nerve had been severed, or he was blindfolded. According to the skeptical view, "Mental processes are unaffected by hypnotic procedures, but the subject acts as if the world were as suggested by the hypnotist". In the example case of hypnotic blindness, the subject would continue to see perfectly well, but would act like a blind person. Let us note, in passing, that nobody ever doubted that H.M. was amnesic, or that Weiskrantz's blindsight patient, R.N., was blind -- because they had brain damage. Which leads me, in my more cynical moments, to reflect on what I have called the irony of self-reports -- which is that all too many psychologists take self-reports seriously only when they are made by people who are brain-damaged!. But I digress. Actually, Sutcliffe himself offered a third view, which is that hypnotic subjects are actually deluded. That is to say, they believe that the world is suggested by the hypnotist. In other words, hypnosis is an altered state of consciousness in which the person's mental representation of himself or the world departs radically from normal. In the example case of hypnotic blindness, the subject believes that he is blind, even though there is no problem with his visual system. Similarly, E.R. Hilgard offered a neodissociation view, that hypnosis entails a division in consciousness. That is, the subject is unaware of certain percepts, memories, thoughts, etc. that nevertheless continue to influence his behavior unconsciously -- that is, outside of conscious awareness and conscious control. In the example case of hypnotic blindness, the subject would not experience explicit perception of visual stimuli, but might show priming effects and other expressions of implicit perception, similar to those seen in blindsight or visual neglect. The most important single fact about hypnosis is the existence of individual differences in response to suggestion. However, hypnotizability cannot be predicted by the usual sort of psychological tests. Instead, it must be measured by work samples of hypnotic response, analogous to the performance tests used for measuring intelligence. Of these standardized scales, the best known are the Stanford Hypnotic Susceptibility Scales and the Harvard Group Scale of Hypnotic Susceptibility. 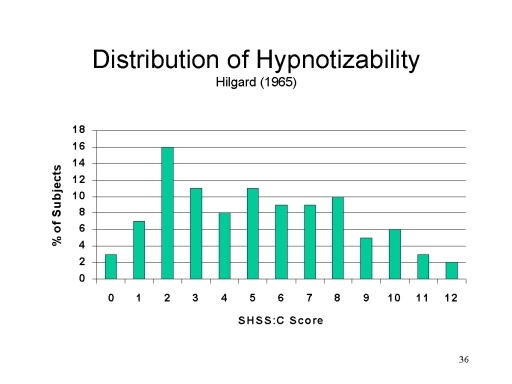 Alternative scales have been published, but the Stanford Hypnotic Susceptibility Scale, Form C is generally considered to be the "gold standard" for measuring hypnotizability. In typical practice, the Harvard Scale is administered first, to acquaint subjects with hypnosis, followed by the Stanford Form C.
Each scale begins with an induction procedure in which the subjects are asked to focus their eyes on a target, and then receive suggestions for continued focusing, relaxation, and eye closure. Eventually they close their eyes, at which point the experimenter administers a series of 12 typical hypnotic suggestions, each of which is scored according to some objective behavioral criterion. For example, during the induction procedure, it is suggested that the subject's eyes are growing heavy and closing. To pass the suggestion, they must close their eyes before the experimenter specifically instructs them to do so. For the hand-lowering suggestion, it is suggested that the subject's outstretched hand is holding a heavy object, pressing the hand and arm down. Subjects must lower their outstretched arms at least 6" before a specified period of time has elapsed. For the mosquito hallucination, it is suggested that there is a mosquito buzzing annoyingly around the subject's face. The subject must grimace or make some effort to brush the insect away. For the posthypnotic suggestion, it is suggested that, after they open their eyes and hear a tapping sound, they will reach down and touch their left ankle. They must do so within 10 seconds of the pre-arranged cue. 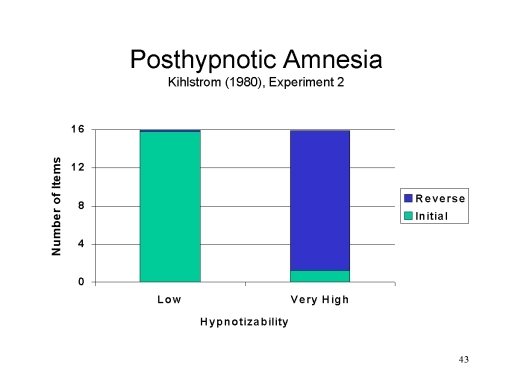 For posthypnotic amnesia, it is suggested that the subjects will be unable to remember the things they did since closing their eyes, until the experimenter says "Now you can remember everything". Subjects pass the suggestion if they remember no more than 3 of the test-suggestions, until the suggestion is canceled by a pre-arranged reversibility cue. Of course, this criterion does not distinguish temporary posthypnotic amnesia from the "permanent" forgetting that would occur if, for example, the subject fell asleep during the procedure (which happens). Accordingly, the criterion for posthypnotic amnesia was subsequently revised. According to this revised criterion, subjects pass the amnesia suggestion if they remember no more than three suggestions before the reversibility cue has been given, plus at least two additional suggestions afterwards. On the individually administered Stanford Scales, these judgments are made by the experimenter. On the group-administered Harvard Scale, the judgments are made by the subjects themselves. In either case, the 12 test suggestions, each scored pass-fail, yield a sum score of hypnotizability on a 0-12 scale. Subjects can be asked to rate how "successful" each suggestion was, according to their own subjective criteria. They can be asked to rate the experience of involuntariness associated with each suggestion. They can be asked to rate other associated (unsuggested) experiences, such as the perceived passage of time while they were hypnotized. They can be asked to give an overall rating of the "depth" to which they experienced hypnosis. 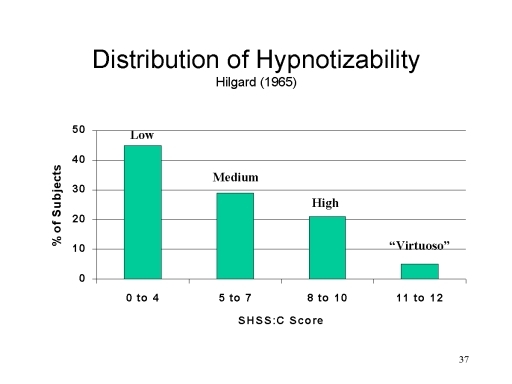 The hypnotizability scales, administered to unselected samples, yield a roughly normal distribution of scores, with a plurality of subjects scoring as relatively insusceptible to hypnosis, and only about 10-15% of the population classifying as hypnotic "virtuosos". It is in these highly responsive individuals that hypnosis is most appropriately studied. There's no point in studying hypnosis in subjects who are incapable of experiencing it. Within the domain of normal personality, hypnotizability is correlated with absorption, which in turn is related to a broad dimension of openness to experience, one of the "Big Five" personality traits. It is not correlated with any of the other four (neuroticism, extraversion, agreeableness, or conscientiousness). We'll discuss absorption later, in the lectures on "Absorption, Daydreaming, and Meditation". No, hypnotizability isn't correlated with daydreaming. And its relationship to meditation can be stated thus: meditators may be able to "get into" hypnosis more readily, but they're not necessarily more hypnotizable. Perhaps the most dramatic perceptual-cognitive alterations associated with hypnosis is hypnotic analgesia, which lies somewhere in between the content-specific negative hallucinations and the modality-specific anesthesias. Beginning with the work of Esdaile and Elliotson, British physicians serving in colonial India in the 1840s, before the introduction of ether and other chemical anesthetics and analgesics, hypnosis has served as the sole anesthetic for a wide variety of surgical procedures, including appendectomy, skin grafts, cardiac surgery, orthopedic surgery, the ligation and stripping of varicose veins, and, especially, obstetrics, including vaginal deliveries and caesarian sections. Esdaile's and Elliotson's early clinical reports excited much interest - -although after Morton's successful demonstration of ether analgesia in 1847, hypnosis was quickly supplanted by ether and other chemical anesthetics. Against the skepticism of his colleagues, Esdaile simply pointed to the fact that his patients eagerly referred their friends and family members to him for treatment. 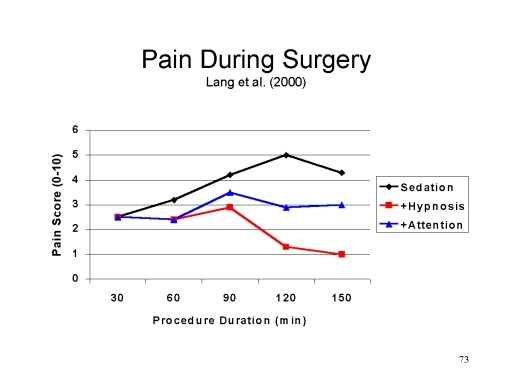 Clinical reports published since the mid-19th century indicate that hypnotic analgesia can be highly effective in relieving the pain of major surgery (for reviews of this literature, see Hypnosis in the Relief of Pain by E.R. Hilgard and J.R. Hilgard, 1975). However, the more common clinical use of analgesia is in the treatment of postoperative pain, episodic pain associated with specific medical and surgical procedures; burns; obstetrics; dentistry; and chronic pain associated with illness. There is also an extensive body of experimental laboratory research, making hypnotic analgesia the most thoroughly studied of all the phenomena of hypnosis. More recent controlled clinical trials confirm what Esdaile and Elliotson knew: hypnotic suggestions for analgesia. 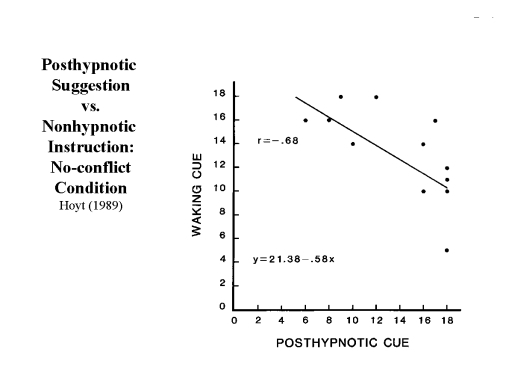 Viewed in terms of effect size, the power of hypnotic suggestions corresponds to a "strong" effect, averaging d >.60, in both clinical and experimental situations. These effects are especially strong in patients and subjects who are relatively high in hypnotizability. Among the most interesting recent clinical studies was by Lang et a. (2000), who employed hypnotic analgesia as an adjunct to conscious sedation in outpatient diagnostic surgery (for example, arthroscopic examination of the knee; a common PCA device is illustrated on the left). All these patients received patient-controlled conscious sedation, in which they were able to self-administer (within limits) benzodiazepine-like drugs that induce sedation and pain relief without loss of consciousness (for more information, see the lectures on "Anesthesia and Coma"; see also the section on Conscious Sedation in the lectures on "Psychedelics"). These patients were then randomly assigned to receive one of two adjunctive behavioral treatments -- that is, treatments delivered in addition to the sedative drug: either hypnotic suggestions for relaxation, reveries, and analgesia; or a nonhypnotic attentional manipulation intended to distract the patient from the procedure and its consequent pain). Patients receiving hypnosis plus PCA reported much less pain than those receiving either PCA alone or PCA plus the attention manipulation -- especially during the latter stages of the surgical procedure. They also reported much less anxiety during the surgical procedure. And they made fewer requests for additional medication -- perhaps the ultimate behavioral proof that they actually felt less pain. (Because of external safety controls, not all requests for PCA result in the actual delivery of medication.) 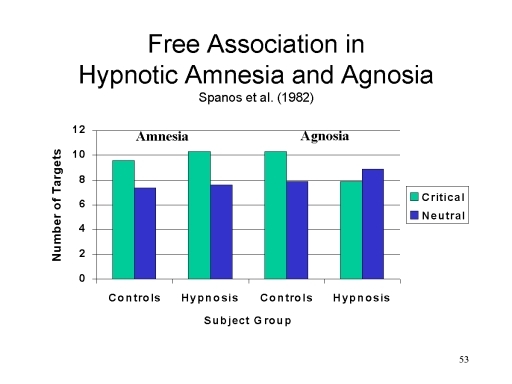 Note that the hypnosis and attention groups were equivalent in that regard. However, there is other evidence, reviewed below, suggesting that hypnosis is not simply a form of distraction. 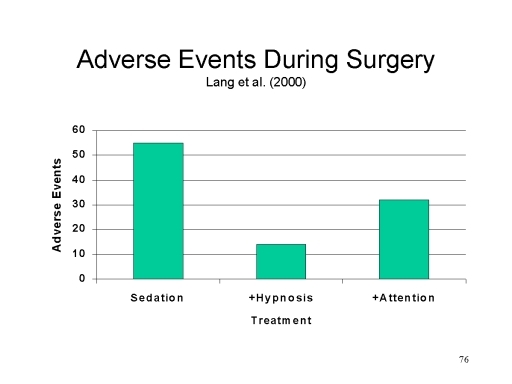 Finally, there were fewer adverse events during surgery when hypnosis was added to the PCA ("adverse event" doesn't necessarily mean something big, like the surgeon losing a sponge or a scalpel. Rather, in surgery, "adverse event" refers to any occasion where the surgery had to be interrupted. On a practical level, this means that the addition of hypnosis, despite the extra expense of the hypnotist (if the anesthesiologist himself doesn't perform this task), is actually more cost-effective. 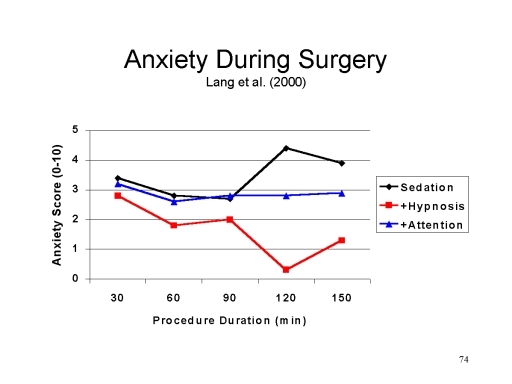 In fact, a later report by Lang & Rosen (2002) indicated that adding hypnosis to PCA actually reduced the average cost of anesthesia by more than 50%. "Suggestion is a great aid in producing a comfortable narcosis ... during the administration, the anesthetist should make those suggestions that will be most pleasing to this particular subject ... talk him to sleep, with the addition of as little ether as possible." In stomach cases, "as soon as the stomach is explored and the method of operation decide upon, the ether is withdrawn, the surgeon being able to continue operation, no more being given until time to close the incision ... thus we are able to complete the operation and avoid vomiting with an exceedingly small amount of anesthetic." The Mayo brothers were well trained surgeons, but no more so than their peers at at Johns Hopkins and Harvard. Why did hundreds trek to remote Rochester, Minnesota ("You can't get there from here")? Because their anesthesiologist was named Alice Magaw, and you didn't die! These clinical results are confirmed by more tightly controlled laboratory studies. In the laboratory, the effect of analgesia was demonstrated in a psychophysical study by Hilgard (1967). subjects classified as low, medium or high in hypnotizability (the last group including some "virtuosos") were exposed to 60 seconds of cold-pressor pain by submerging their hand and forearm into circulating ice-water. In this laboratory analog of clinical pain, the pain mounts fairly quickly. The subjects gave pain reports on an open-ended 1-10 scale (meaning that they could use numbers higher than 10) both with and without suggestions for analgesia. The suggestions had little effect on the insusceptible subjects, and a little more effect on those of moderate hypnotizability, but reduced felt pain by half in highly hypnotizable subjects. The illustration at right shows a typical cold-pressor apparatus. 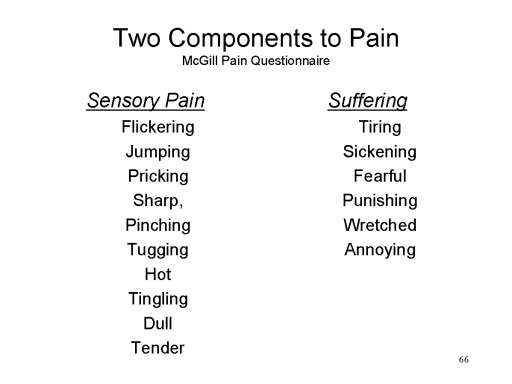 Pain has two components, sensory pain (providing information about the location and severity of irritation or injury), and suffering (a psychological reaction depending on the meaning of the sensory pain). 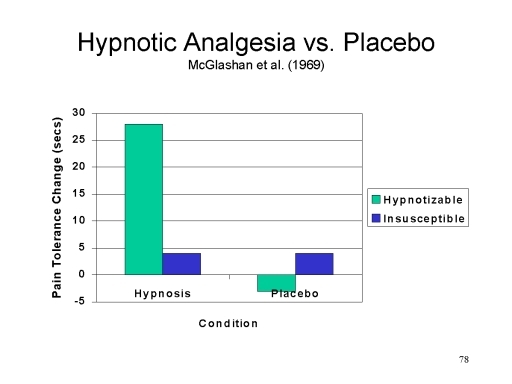 Hypnotic analgesia alters both the qualia associated with sensory pain and the intentionality associated with suffering. An absolutely spartan study by Stern et al. 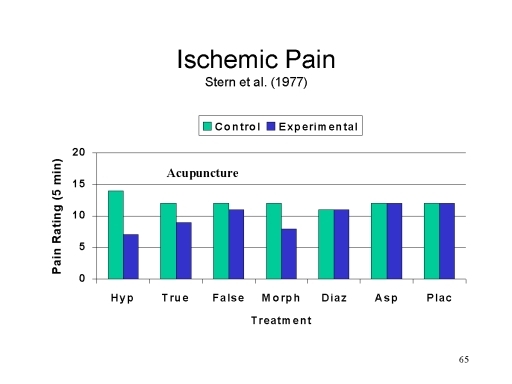 (1977) compared hypnotic analgesia with a number of other "pain-challenging" treatments, including true acupuncture (with electrical stimulation of the acupuncture needles), placebo acupuncture, morphine, aspirin, diazepam, and placebo pill. 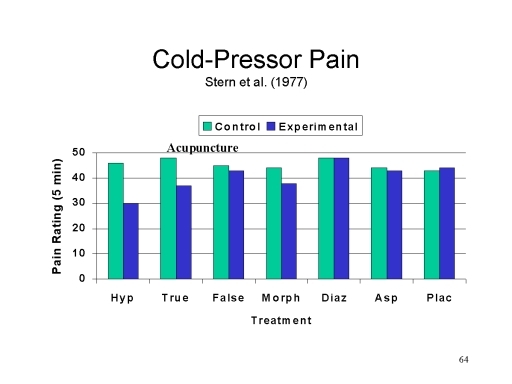 Hypnotizable subjects were exposed to both cold-pressor and ischemic muscle pain under both experimental and control conditions for each of the challenging agents. So, if you're doing the multiplication, that's 2 (experimental vs. control) x 2 (cold-pressor vs. ischemia) x 7 (challenging agents) = 28 pain trials per subject! In ischemic muscle pain, illustrated in the slide above, the flow of blood to a forearm is occluded (this is ischemia) by a blood-pressure cuff, and then the subject is asked to do some work, like exercising with a hand dynamometer. This exhausts the supply of oxygen to the muscles in the hand, and pain mounts quickly (the arm also turns blue, which makes it even more fun). Like cold-pressor pain, ischemic muscle pain is an excellent laboratory analog of clinical pain. 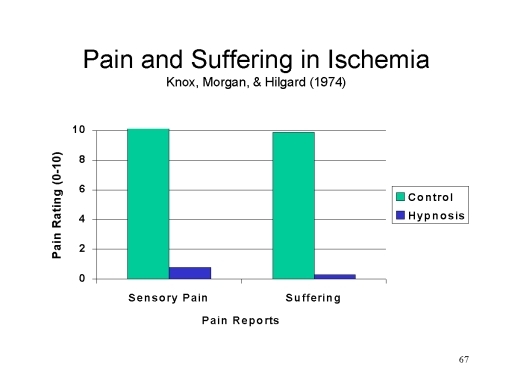 The basic result of the experiment was that hypnosis was the most effective of the various agents tested -- even more effective than morphine, for both cold-pressor and ischemic pain. 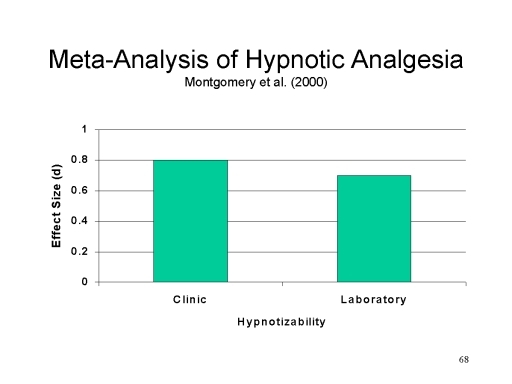 Other laboratory studies indicated that hypnosis does not act as a tranquilizer or as a placebo. Hypnotic analgesia is not reversed by naloxone, an opiate antagonist, so it is not mediated by the release of endogenous opiates (endorphins). With respect to the psychological mechanisms underlying hypnotic analgesia, most attention has focused Hilgard's proposal that analgesia is mediated by an amnesia-like dissociative barrier which diminishes the subject's conscious perception (awareness) of pain. 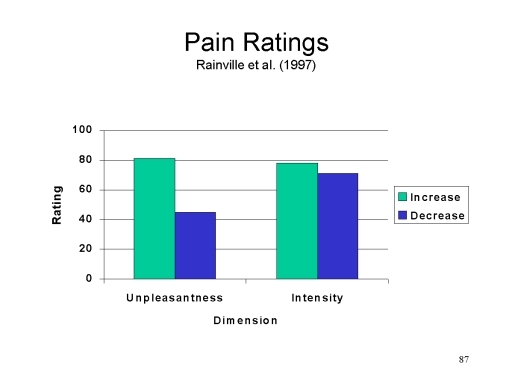 Some evidence for this dissociative process comes in the form of Hilgard's studies of the "hidden observer", which revealed a persisting subconscious representation of pain, as well as observations that hypnotic analgesia does not alter psychophysiological responses to the pain stimulus. Based on this evidence, it appears that hypnotic analgesia alters the explicit but not the implicit perception of pain, just as posthypnotic amnesia alters explicit but not implicit memory. In opposition to this dissociative view, Spanos has proposed that hypnotic subjects engage in stress inoculation procedures, such as self-distraction and recoding, which alter the subject's response to, but not his/her awareness of, the pain stimulus. A series of studies by K.S. Bowers attempted to determine whether hypnotic analgesia is mediated by stress-inoculation strategies of the sort proposed by Spanos. 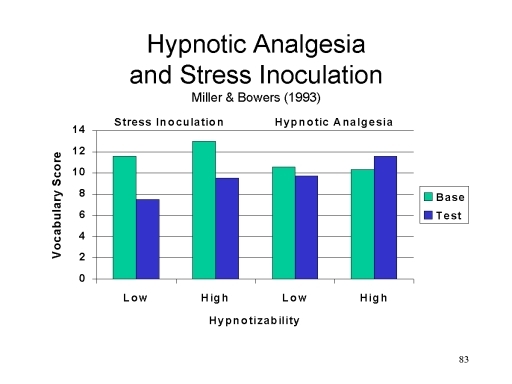 Miller and Bowers (1986) found that subjects administered hypnotic suggestions for analgesia did not report engaging in stress inoculation strategies. Moreover, response to hypnotic analgesia suggestions was mediated by hypnotizability, while response to stress-inoculation instructions was not. 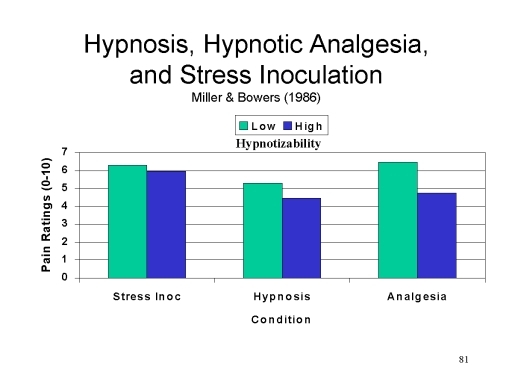 A second paper by Miller and Bowers (1993) showed that strategic stress inoculation interfered with performance on a difficult vocabulary test, while hypnotic analgesia did not. 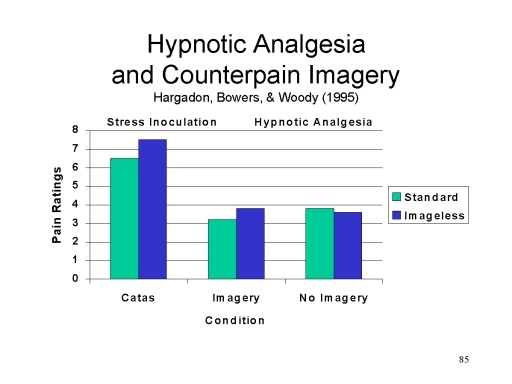 Hargadon, Bowers, and Woody (1995) showed that the use of counter-pain imagery, a common stress inoculation strategy, had no effect on hypnotic analgesia. Taken together, these studies show that stress inoculation can reduce pain, but it does not mediate pain reduction in hypnotic analgesia. Posthypnotic amnesia is so central to the experience of hypnosis that it gave the state its name. However, it does not occur unless it is suggested to the subject (directly or by implication), so it is not an instance of "state-dependent" memory. 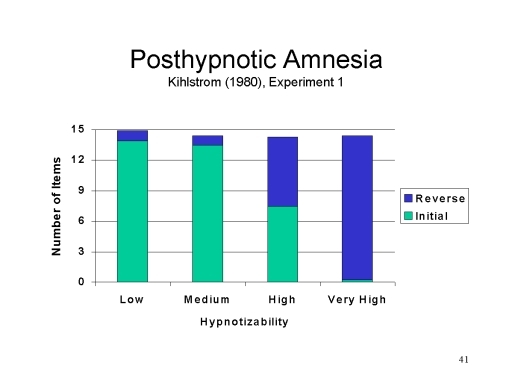 On t he standardized hypnotizability scales, such as the Stanford Form C, the suggestion for amnesia is administered toward the end of the scale, and covers the other suggestions that were administered during testing (including the suggestion for posthypnotic amnesia, if there is one). Suggestions for amnesia always include the arrangement for a signal, known as a reversibility cue, to cancel the amnesia suggestion. Compared to insusceptible subjects, hypnotizable subjects perform relatively poorly on tests of free recall (Rl) and recognition (Rn) while the amnesia suggestion is in effect. 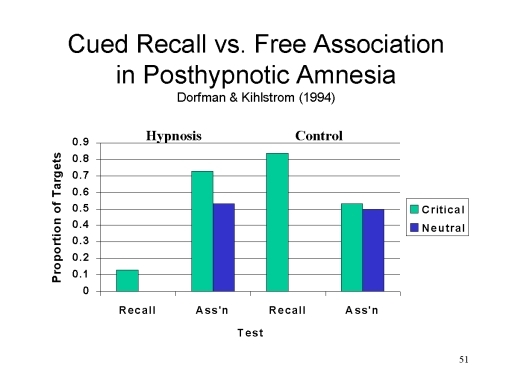 But they perform normally on a test of free recall after the amnesia suggestion has been canceled by the reversibility cue. Reversibility makes clear that posthypnotic amnesia reflects a disruption of memory retrieval, as opposed to encoding or storage. And because the subjects are wide awake during both initial amnesia and reversibility, reversibility confirms that posthypnotic amnesia is not a reflection of state-dependent memory. In the laboratory, posthypnotic amnesia is usually studied by giving subjects a list of words to study, or memorize, while they are hypnotized. Then the subjects receive a suggestion that they will forget what they did or experienced during hypnosis, including the learning experience, until the hypnotist gives the reversibility cue. A pair of studies from my laboratory showed that posthypnotic amnesia impairs explicit memory, as reflected in recall or recognition, but spares implicit memory, as reflected in priming effects on free association or category generation. In Experiment 1, subjects memorized a list containing words like girl, chair, flowers, and short under hypnosis, and then received suggestions for posthypnotic amnesia. The virtuoso subjects were unable to recall the list items, showing the predicted impairment in explicit memory. Later, they were asked to free-associate to "critical" stimuli such as boy, table, blossom, and long, which were intended to target the studied words as free associates; they also free-associated to other, "neutral", words, such as lamp (light), dogs (cats), and man (woman), which did not target the memorized items. Subjects were more likely to give the targeted responses to "critical" vs. "neutral" stimuli, showing a priming effect. But the magnitude of the priming effect did not differ between the hypnotizable subjects, who were amnesic for the critical targets, and the insusceptible subjects, who were not amnesic. Experiment 2 had exactly the same format, except it employed a different test of implicit memory. This time, the subjects memorized a list containing instances of various conceptual categories, such as Judy, foot, lion, and day. For the implicit memory test, the subjects were asked to generate instances of "critical" categories, such as woman's name, body part, animal, and period of time; there were also "neutral" categories, such as man's name, country, article of clothing, and color. Again, the virtuoso subjects, who were densely amnesic on a test of free recall, showed priming effects that were the equivalent to those shown by the insusceptible, non-amnesic subjects. In both experiments, posthypnotic amnesia impaired explicit memory, in the form of free recall, but spared implicit memory, as reflected in priming on the free-association or category-generation tasks. And in both cases, the preserved priming was semantic in nature -- not merely repetition priming. A more recent followup study by Jennifer Dorfman confirmed these essential results. Another study, by Barnier et al. (2001), compared repetition and semantic priming. As usual, the subjects studied a word list in hypnosis, followed by an amnesia suggestion. then the subjects were given a cued-recall test of explicit memory, followed by fragment completion test of repetition priming and a word-association test of semantic priming. As expected, the hypnotizable subjects showed amnesia on the cued-recall test of explicit memory; but compared to baseline levels, both the insusceptible/nonamnesic and the hypnotizable/amnesic subjects showed significant priming on both tests of implicit memory. In another study, David et al. (2000) applied a variant of Jacoby's Process-Dissociation Procedure to posthypnotic amnesia. The subjects studied the usual sort of word-list, followed by an amnesic suggestion, and then completed a stem-cued recall test of explicit memory and a stem-completion test of implicit memory. In their variant on PDP, they were able to decompose stem-completion performance into three components: voluntary conscious memory -- essentially explicit memory; involuntary conscious memory, in which the cue automatically brought a word to mind which was subsequently recognized as a list item; and involuntary unconscious memory, essentially implicit memory. Compared to insusceptible subjects, the hypnotizable subjects showed a profound deficit on both measures of conscious, explicit memory (both voluntary and involuntary; but performed equally on the measure of involuntary, unconscious, implicit memory. The dissociation between explicit and implicit memory observed in posthypnotic amnesia resembles those discussed earlier, in the lectures on Explicit and Implicit Cognition, in cases of the amnesic syndrome or electroconvulsive therapy. However, the dissociation observed in hypnosis differs from that observed in other forms of amnesia: the memories lost were deeply processed at the time of encoding; the preserved priming is semantic rather than perceptual in nature; and the amnesia is reversible. Reversibility marks posthypnotic amnesia as a disorder of memory retrieval, rather than of encoding or storage. Posthypnotic amnesia is a disruption in episodic memory, but there is also some provisional evidence for hypnotic agnosia, involving disruptions in semantic memory. Whereas posthypnotic amnesia spares priming in free association, hypnotic agnosia appears to impair free associations. Although hypnotic amnesia and agnosia appear to impair conscious awareness of memory, it has also been claimed that hypnotic suggestions can restore conscious access to memories which have been lost due to repression, dissociation, or even ordinary forgetting. However, clinical folklore about the effectiveness of hypnotic hypermnesia has not been validated by appropriately controlled laboratory and clinical studies. 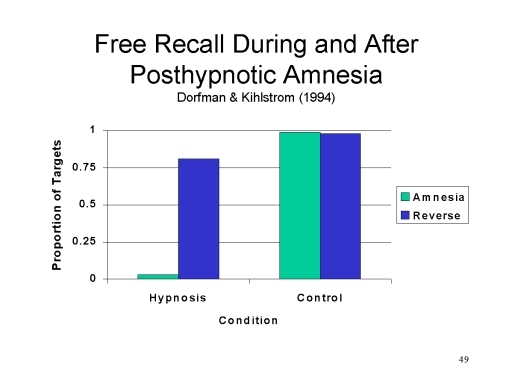 Hypnosis adds nothing to the hypermnesia observed with repeated recall trials in the normal waking state, even among highly hypnotizable subjects. Following hypnotic suggestions for hypermnesia, the bulk of new items remembered are false rather than accurate. When waking recall is retested in hypnosis, subjects tend to promote guesses to confident memories, and appear more responsive to leading questions. In summary, the evidence indicates that hypnosis exaggerates false recollection, increasing the frequency of false alarms but not of hits, and it also inappropriately increases the subjects' confidence in their memories, regardless of whether these memories are true or false. These results from laboratory studies are supported by more "real-life" experiments involving memory for staged crimes and comparisons of hypnotic and nonhypnotic techniques with actual witnesses and victims. 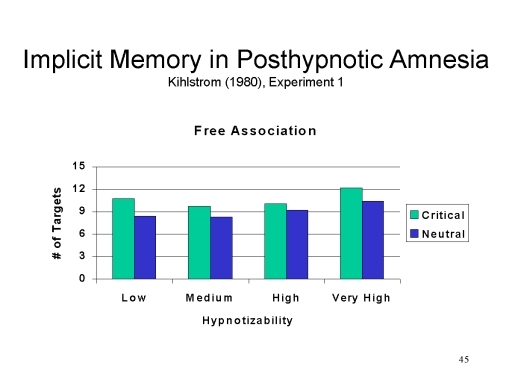 Hypnotic hypermnesia is the illusion of enhanced memory. Another illusory alteration of memory is hypnotic age regression, where the subjects receive suggestions to return to a previous time in their lives (or, in some cases, to previous lives!). Although some subjects respond to such suggestions with displays of childlike behavior, there is no evidence that age regression actually entails a psychological return to childhood, as measured by ablation (the loss of adult declarative and procedural knowledge), reinstatement (the return to archaic modes of cognitive and emotional functioning), or revivification (the restoration of forgotten memories of childhood). Hypnotic age regression, like hypnotic hypermnesia, is illusory. The illusory nature of hypermnesia and age regression indicates that these techniques are not suitable for refreshing memories of witnesses and victims in forensic situations; nor are they recommended for recovering memories of trauma and other experiences of childhood. 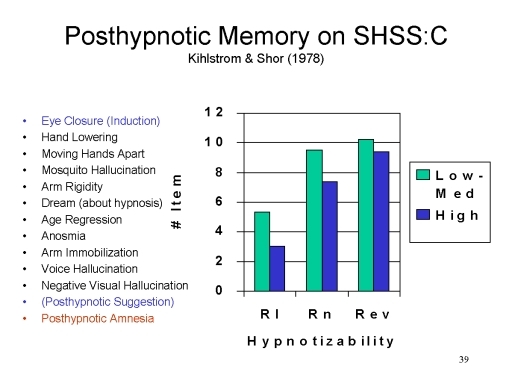 In the absence of independent corroboration, no credibility should be attached to any memory "recovered" by means of hypnosis; hypnotically recovered memories should be considered to be inherently unreliable. Just as hypnotic suggestion can alter conscious memory, so it can alter conscious perception. 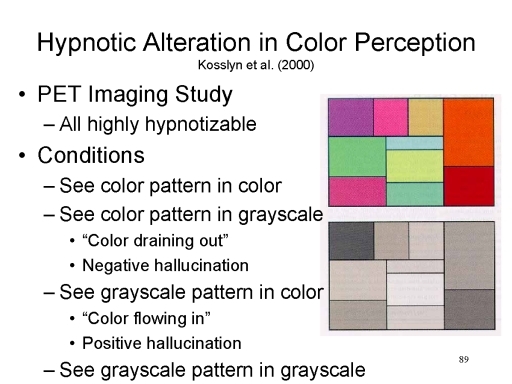 The hypnotic effects on perception take four forms: positive hallucinations (where the subject perceives some object not actually present in the environment); negative hallucinations (where the subject fails to perceive an object that is actually present); anesthesias (reduction in acuity in some sensory modality), and hyperesthesia (enhanced acuity). With the exception of some provocative evidence for improved visual acuity in myopic subjects, the effects of suggestions for hyperesthesia, like suggestions for hypermnesia, appear to be illusory. 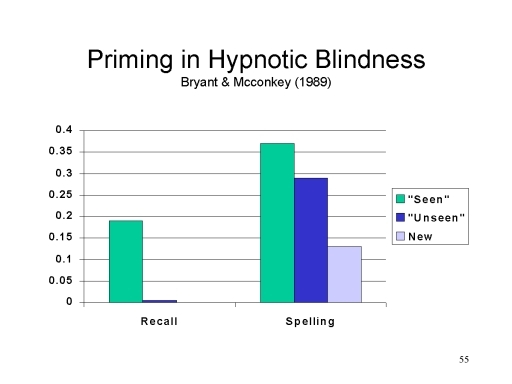 Priming has also been used to reveal implicit perception in hypnotic blindness. In one study, subjects were given hypnotic suggestions for blindness, and then presented with cards on which were printed a homophone and a disambiguating cue word (e.g., war-peace). The subjects were unable to recall the words that had been presented to them, providing prima facie evidence of blindness (you can't consciously recall an event you didn't consciously perceive!). Nevertheless, when administered a spelling test including both "seen" and "unseen" homophones, they showed a strong tendency to spell the homophones in accordance with the way they were presented (e.g., peace rather than piece). Suggestions can be given during hypnosis for behaviors that will be executed outside hypnosis, in response to a cue. These posthypnotic responses appear to be automatic, but they do not fulfill the standard criteria for automaticity. They are not inevitably evoked by the relevant cue. The rate of responding to the posthypnotic cue generally diminishes, the further away the subject gets from the laboratory setting in which the cue was established. Moreover, and their execution consumes cognitive capacity. In one study, subjects were given two competing tasks to perform, one consciously and the other posthypnotically. The posthypnotic task interfered with execution of the conscious task (and vice-versa). Beyond pain control there are a number of interesting studies of the "psychosomatic" effects of hypnotic suggestion. A classic clinical study by Mason successfully used hypnotic suggestions to relieve a case of congenital icthyosiform erythroderma of Broq. Other studies indicate that hypnotic suggestion can modulate allergic responses and accelerate the healing of burns. Most systematic study has been devoted to the treatment of warts. A number of well-controlled studies indicate that suggestions can lead to the remission of warts, although the operative factor appears to be suggestion, independent of hypnosis. The psychosomatic effects of hypnotic and nonhypnotic suggestion shed new light on the mind-body problem by showing how one’s mental state (i.e., beliefs, images, and expectations) can alter one’s physical state (e.g., allergic reactions or warts). Some of these studies are discussed in the lectures on Psychosomatic Effects. Brain-imaging studies of hypnosis have now begun to appear. One study, by Rainville et al. (199&0, used hypnotic suggestions to reduce and enhance the "suffering" component of pain, leaving the "sensory" component unaffected. 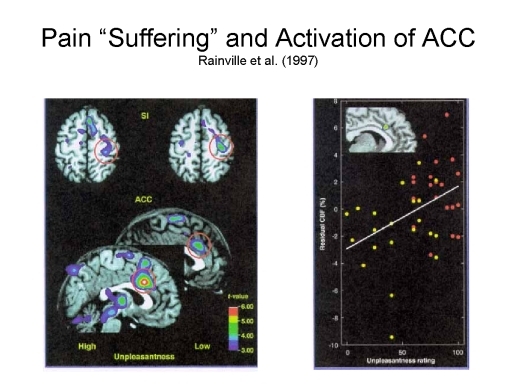 PET imaging revealed that hypnotic modulation of suffering was associated with changes in the anterior cingulate cortex, leaving the primary sensory cortex unaffected. Apparently, the primary sensory cortex mediates sensory pain, while the anterior cingulate cortex mediates suffering. Another PET study, by Kosslyn et al. 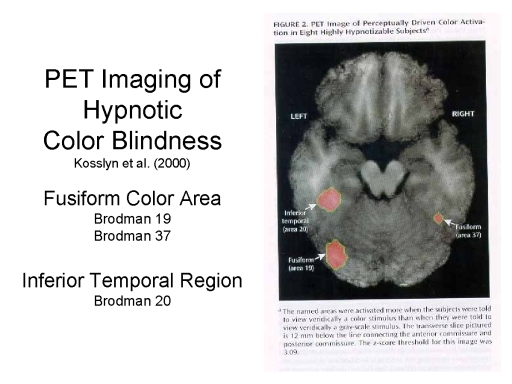 (2000), showed that hypnotic modulation of color perception ("draining" or "adding" color to a stimulus) affected activation in the "fusiform color area" and the inferior temporal region of cerebral cortex. 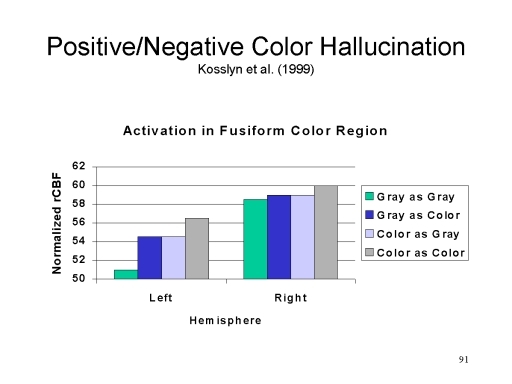 In hypnosis, perception of color, real or hallucinated, led to activation of the fusiform color area, with the effects are clearer in the left cerebral hemisphere than in the right. Somewhat similar effects were observed in unhypnotized subjects who received the same suggestion. It's the experience that matters, not whether the subject was hypnotized. 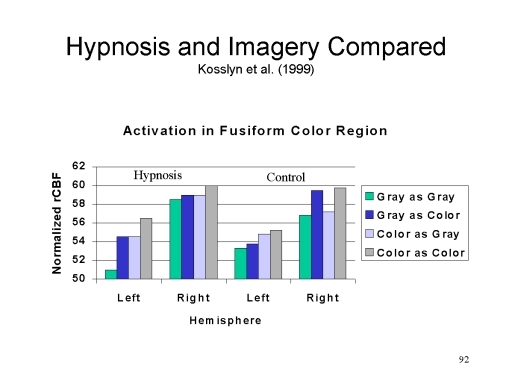 However, activation in the left fusiform area was affected only during hypnosis. The right fusiform activation was affected in both the hypnotic and the control condition. Studies of posthypnotic amnesia reveal a dissociation between explicit and implicit memory: amnesic subjects cannot consciously remember events that nonetheless continue to influence their behavior. 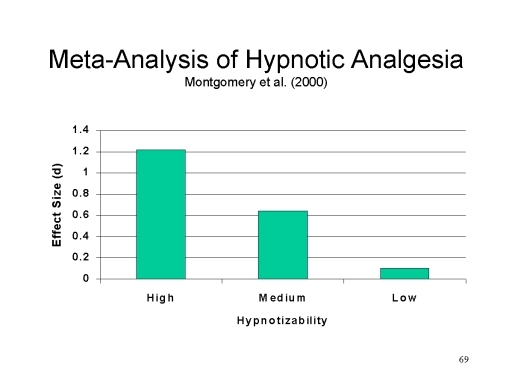 Similarly, hypnotic analgesia may serve to illustrate the dissociation between explicit and implicit perception. The subject is not aware of pain inflicted by the stimulus (an impairment of explicit perception), but studies of the hidden observer, and of psychophysiological responses to the pain stimulus, indicate that implicit perception of pain is spared. Studies of hypnotic deafness, hypnotic blindness, and negative hallucinations also appear to illustrate the dissociation between explicit and implicit perception in the visual and auditory domains. Taken together, these findings are consistent with the notion of an amnesia-like barrier which alters conscious awareness while permitting subconscious processing to continue, as suggested by Hilgard's neodissociation theory of divided consciousness. This page last revised 02/26/2017.